Rock Your Merch Style Guide - Grace VanderWaal | YAYOMG! 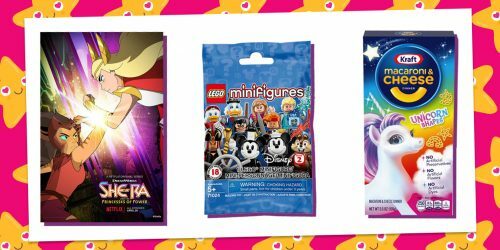 With concert and festival season right around the corner, you’ll likely be stocking up on merch from the shows you attend. That’s why we’re putting together a new style series for our readers, the Rock Your Merch Style Guide! The biggest problem with concert merch is it’s often not that cute or way too big, so you end up wearing it as your casual hang around the house shirt or bedtime tee. But rocking your favorite bands and singers merch is a sign of pride and fandom, which is why we’re here to help! 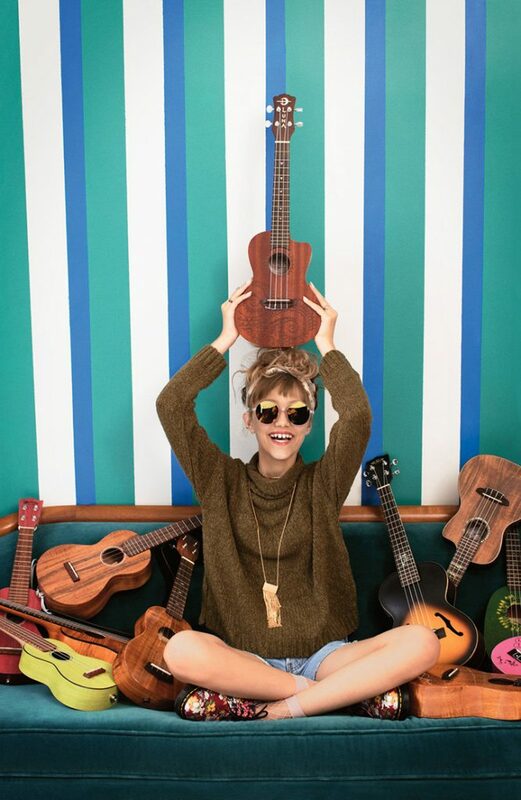 We knew that we HAD to choose the incredibly talented Grace VanderWaal to kick this series off. Not only is her music amazing, but she’s a genuinely inspiring girl who spreads kindness wherever she goes. 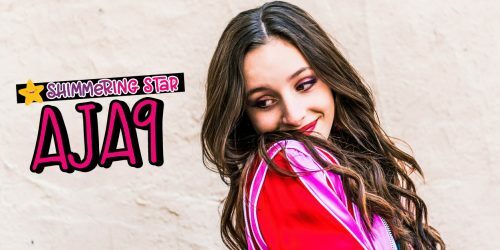 Grace just landed a coveted spot as the opening act for Imagine Dragons this Summer and is hot off the tails of her Just the Beginning tour. Grace’s gorgeous voice paired with her ukelele stylings and relatable lyrics make her songs pretty hard to take off repeat. Since she’s so hands-on with all aspects of her career, you can bet that her merch matches her vibe and is on point! 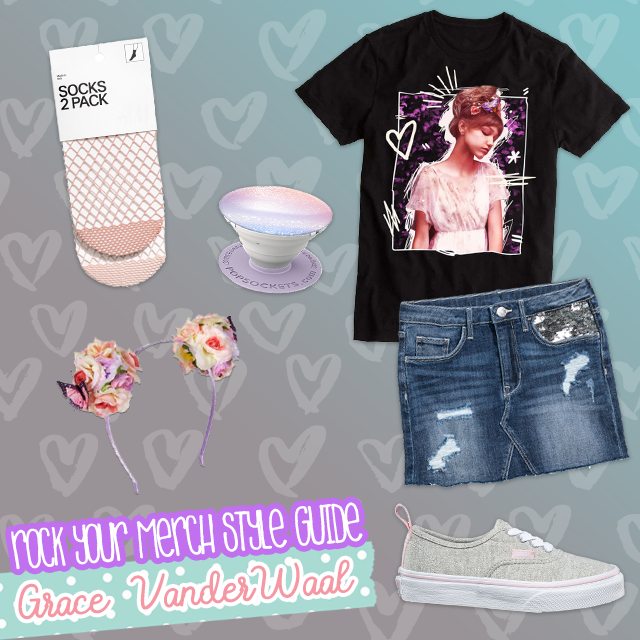 Here’s our advice on how you can style your Grace VanderWaal merch! 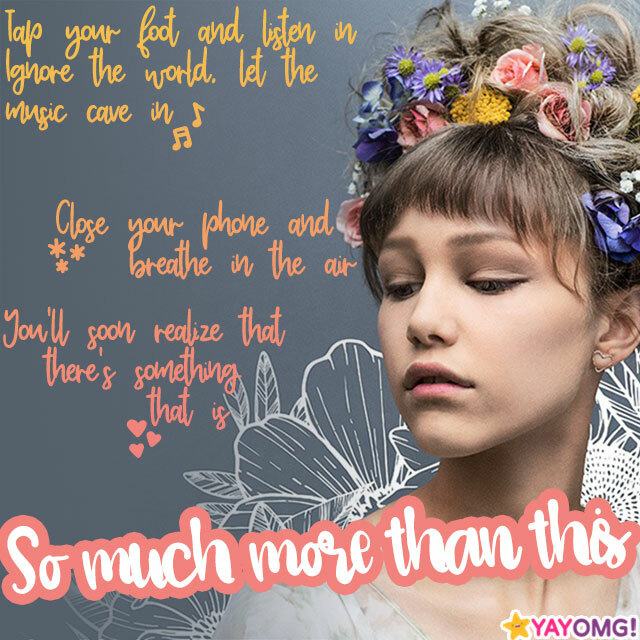 Whether you’ve already stocked up on your Grace VanderWaal merch or you’re hoping to pick some up when you catch her on tour this Summer, there’s one thing for sure – there’s lots of really cute stuff to choose from. 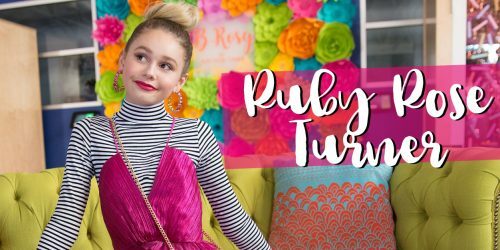 From hoodies and tees to accessories and jewelry, you name it – she’s got it on her website and merch booth. We love this Fanderwaal long sleeve so much, we ended up swapping out a different item while working on putting these looks together since it was recently to the shop. 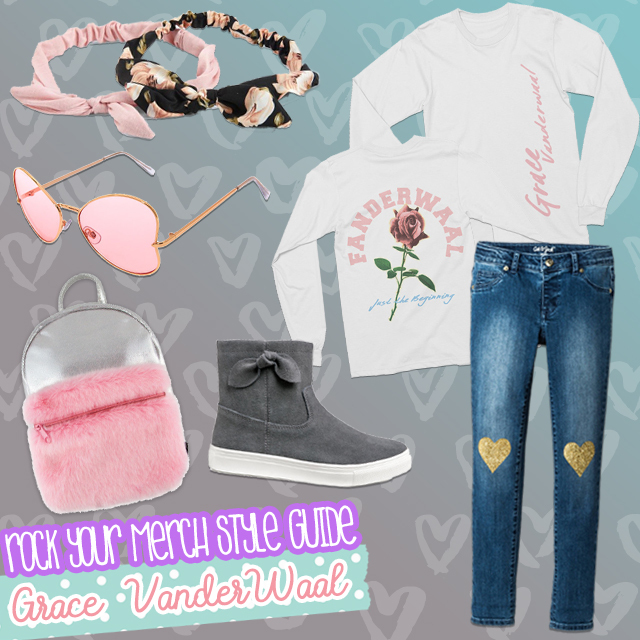 For this look, we went with a combination of Grace’s signature style, mixed in some of the pastel pinks from the top itself, and created a comfy, yet super chic look that you can easily wear to a concert, school, or pretty much anywhere. Grace wears a lot of pretty headwraps, headbands, and adorable sunglasses, so we wanted to be sure to capture that in this look. One of the most crucial parts of any concert look is a pair of comfortable shoes. We know you want to look cute while singing along to all your favorite songs, but you’ll be dancing in the moonlight for most of the night, so you’ll want to be as comfy as possible. This look is just an idea to inspire you, so feel free to swap in or swap out anything you want to make the look your own. How amazing is this band tee? We love that it’s got a bit of rock diva to it while still being super pretty and girly. For this look, we kept with a similar theme as the last so you can mix and match the looks. This time we added a little bit of edge in the form of rips and sequins with this cute denim skirt. 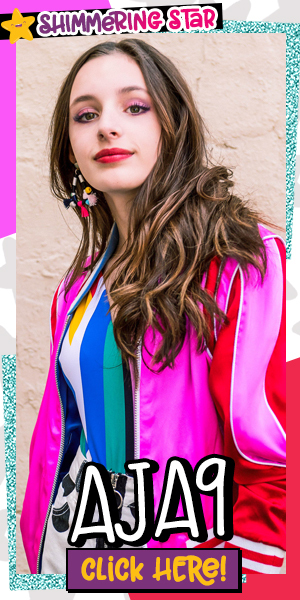 This look is great for Summer, and you can simply switch out your Grace VanderWaal scribble tee for pretty much any other top you might want to rock that day. We chose a flower pom-pom headband for this look so you can match Grace’s style in the photo on the shirt, but you could even craft your own flower crown if you want to make your look extra special. For added flair, we went with some fishnet ankle socks. We’ve seen Grace wear a similar pair, so it’s a perfect way to add an extra VanderWaal vibe to your look. A PopSocket makes it easy to grip your phone for concert pics, but remember to put your phone down and make some memories. Pro-Tip from some seasoned concert goers? You’re at the show to see Grace show off her talents and have a great time, not just record the whole thing for your Instagram story. Snap a few pics to look back on, and then stash your phone away and enjoy the show. We promise you’ll thank us when you have vivid memories of the concert! if you liked these styles, be sure to check out our other lookbooks and leave us a comment on Instagram to let us know who’s merch you’d like us to style next!